Taking a look back at the legendary road race. The Mille Miglia road race was one of the most exciting and intense endurance races ever held. It spanned 1,000 miles and ran from Brescia, Italy, south to Rome, where competitors turned around and went back to the northern Italian city. It was the only race that actually frightened legendary driver, Stirling Moss, and was put to an end in 1957 after two fatal accidents occurred, pushing the total number from its start in 1927 to 56 deaths as a result of the race. Today, the spirit of the race lives on as the Mille Miglia Storica historic rally that features participants driving pre-1957 models. It was races like these where man fought through harsh and dangerous conditions to take the checkered flag that made racing and the automotive industry what it is today. Afzal Kahn has unveiled a new Rosso Mondiale Mille Miglia edition Range Rover Sport model to pay tribute to the iconic race and keep its memory living on today. 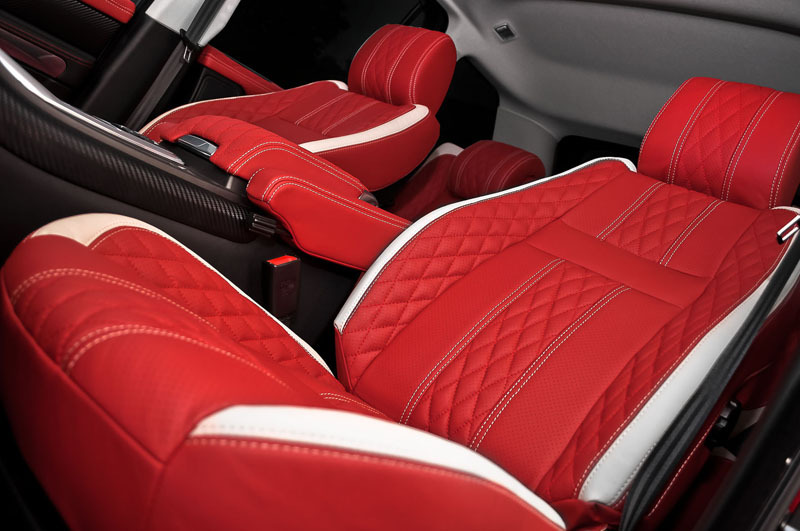 The new Rosso Mondiale Mille Miglia edition Range Rover Sport wears a beautiful red color inside and out that expresses its Italian character. Numerous upgrades were made to the body to emphasize sport and style with the front benefitting from new RS vented wheel arches with air dams, LED daytime running lights, a grille with 3-D mesh, side vents, and an extended lip spoiler. New RS rear wheel arches with integrated air dams, a carbon tailgate trim, body colored door handles, and new Kahn enamel fender shields and tailgate logo complete the body transformation. The final touch is a set of 9.5 x 22 front and 11 x 22 rear (concave) Kahn RS600 wheels with the original center caps, red painted brake calipers, and tinted privacy glass. 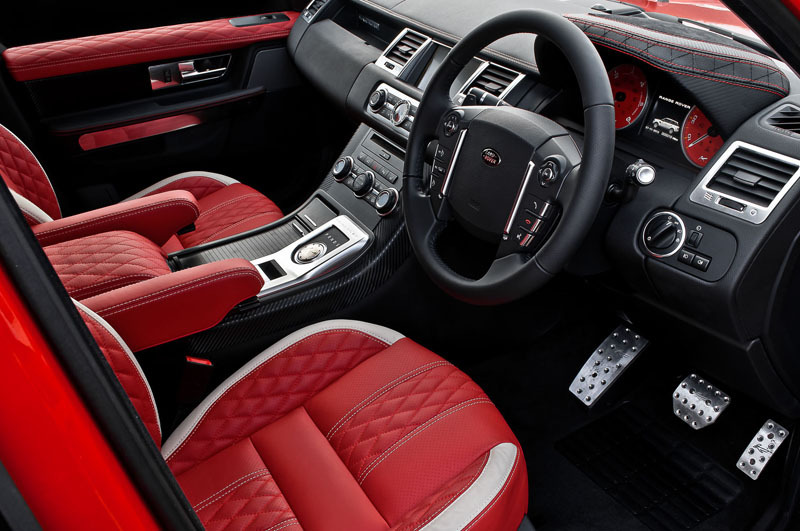 The same Mille Miglia red theme carries over into the cabin of the Range Rover Sport SDV6 HSE where passengers are greeted with a wealth of supple red and black refinements. All four of the seats are outfitted with red quilted and perforated leather with contrasting stitching and unique ivory leather inserts. The same quilted red leather with contrasting stitching is used on the center arm rest and door tops, while the instrument binnacle features quilted black leather with red stitching. Special features such as a pair of red Kahn gauges, a red Kahn time clock surrounded by a Swarovski diamond bezel, a diamond gear selector, and an interior fascia trim set create a rich, custom-tailored environment. Even the floors were given a special touch with new illuminated Kahn stainless steel door entry sills and machined aluminum foot pedals. The new Rosso Mondiale Mille Miglia edition Range Rover Sport by A Kahn Design may not be the pre-1957 sports car that zoomed through 1,000 miles of public roads in the Mille Miglia, but it pays homage to a legendary race that made its mark in the automotive world for years to come. 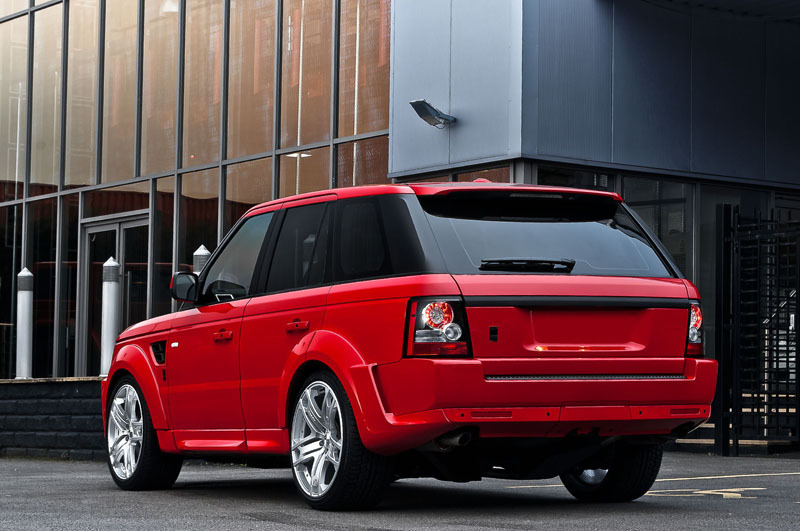 What do you think of the styling of the Rosso Mondiale Mille Miglia Range Rover Sport? Leave a comment and let us know! BREAKING NEWS: Hidden Technologies Revealed!